\r\nNEW DELHI: BJP leader Sushma Swaraj\'s "mota maal" remark continued to reverberate with RJD leader Lalu Prasad on Tuesday accusing the party of having made mega-bucks from the mining barons, the Reddy brothers of Karnataka, while she instead accused the Congress of benefitting. \r\n"With regard to the mota maal (mega-bucks) remark by BJP leader Sushma Swaraj, we want to know who used to take "mota maal" from the Reddy brothers of Karnataka," the Rashtriya Janata Dal leader told reporters. \r\nIn the evening, Sushma Swaraj hit back, tweeting that it was the Congress that had made the money by allocating mining rights to the Reddy brothers, who are accused of large scale illegal mining. \r\n"I want to tell them and the country that they are the ones who got the mota maal from the Reddy brothers," the Bharatiya Janata Party (BJP) leader tweeted. \r\nShe said the Reddy brothers, one of who is in jail, got all the mining rights "on recommendation from Congress chief ministers and it was given by the Congress government". \r\nSushma Swaraj also demanded that all the documents relating to the economic benefits accruing to the Reddy brothers be made public. \r\nThe BJP leader had Monday alleged that the Congress had made "mota maal" from the coal blocks allocation which the government auditor has faulted for allegedly causing huge loss to the exchequer. \r\nLalu Prasad, whose RJD supports the United Progressive Alliance (UPA), told reporters outside the Parliament House that the BJP governments in Chhattisgarh, Jharkhand and Madhya Pradesh had allowed massive mining in their states and should be questioned. \r\n"Let\'s have a discussion on all this first. The BJP does not want a discussion on their own states," he added. \r\nOn Monday, finance minister P. Chidambaram had rejected Sushma Swaraj\'s allegation that the Congress party was paid bribes in allocation of coal blocks during 2004-08. Referring to the Hindi phrase "mota maal", he had said: "I think such phrases should be avoided." \r\nThe Reddy brothers, two of who are former state ministers in Karnataka, are accused of illegal mining. One of them, Janardhana Reddy, has been in prison since Sep 5 last year. Karnataka is ruled by the BJP. Aww, do not call them mota maal. They look cute. Badri is only going to see old men and women ..
this italian led govt has looted India like anything.. never before has one seen such thick skinned politicians.. govt going down soon..
\r\ndid you mean sexually or what ? marvi tu apne hi pair pe kulhadi kyon marwa raha hai?? 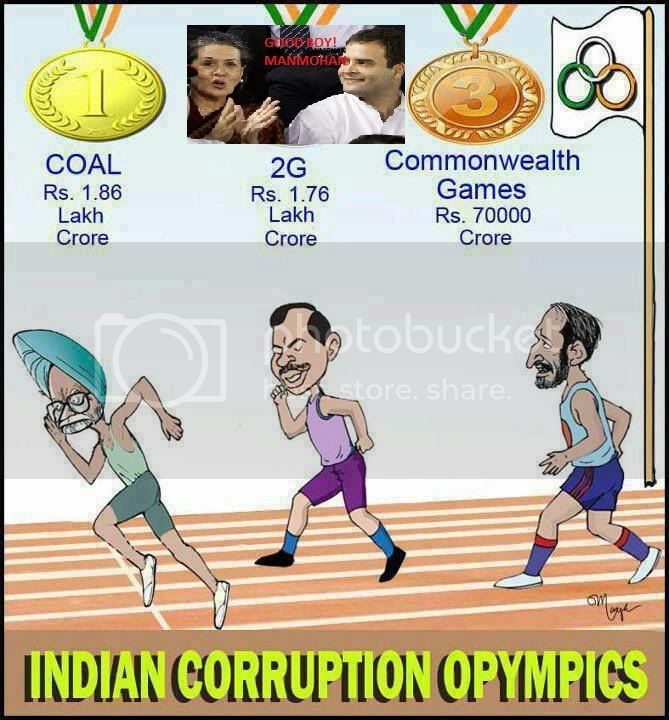 Where is Sonia in that race? Oh wait she must be the judge of the competition. erosion of values I suppose, it starts right from the family unit and then percolates upwards. Even vegetable vendor cheats u if you don\'t supervise him wen he is measuring your vegetables. So a watchdog kinda thing is required or still better, people should be aware. Lampooning will not reform a system. \r\nSudharwadi banna padega, na ki, critic.We have start from a family unit. every parent has the moral and societal responsibility to teach their kids the value of ethics and morality. \nachhi waali dhulaayi ki,....Perhaps that\'s why they say,..... zugmugagti safedi Nirma se aaye,...... Kapde dhul-dhul jaaye,..... Jaya, Sushma, Hema aur rekha ki pasand,.. Nirma ! Good show by Sushma ji. She acknowledged that It was Nehru\'s vision that two nations getting independence at same time, went on two very different paths, India through Nehruvian vision and actions (AIIMS, PGI, IIT, IIM) created highly skilled professionals who earned good name for India throughout the world. erosion of values I suppose, it starts right from the family unit and then percolates upwards. Even vegetable vendor cheats u if you don't supervise him wen he is measuring your vegetables. So a watchdog kinda thing is required or still better, people should be aware. Lampooning will not reform a system. Sudharwadi banna padega, na ki, critic.We have start from a family unit. every parent has the moral and societal responsibility to teach their kids the value of ethics and morality.